With no less than three Inspired To Change Hypnotherapists working in Kent, we like to hang out together once in a while. It’s all part of our philosophy of working as a team despite each of us running our own individual practices, specialising in different areas and choosing our own working hours. I recommend it, it’s great; in fact it’s such a great idea, it won us an award. Ali Hollands, our Inspired to Change hypnotherapist in Maidstone, came up with the idea for our latest Inspired to Change Kent outing and suggested we went to a lecture hosted by the funzing.compeople, who offer talks and experiences on a variety of quirky, often psychological, subjects. This particular lecture was to be given by Dr. David Hamilton, an organic chemist by training, at The Maudsley Hospital training & Education centre in London. Dr. David Hamilton worked for 4 years in the pharmaceutical industry, working for a large pharmaceutical company developing cardiovascular drugs. During the course of this work, he became fascinated by the phenomenon of the placebo effect, and as a result left research work to write books, and educate people on how they can harness the power of their mind to help their bodies. As a pharmacist, the paradox of the placebo effect is well known to me. It’s a strange but very well-documented effect, where those taking part in clinical trials that are given a ‘blank’ pill, containing no active ingredient at all, actually derive a physical benefit from it similar to those in the trial that are given the actual drug. The existence of the effect is the very reason behind the design of the ‘gold standard’ double blind trial, where a new drug is tested in two groups of volunteers. Each volunteer is given either the new drug, or a blank (the placebo) but neither they, nor the medical and research team, know who has received what until the end of the trial. In this way, the ‘genuine’ effect of the new drug can be assessed, without the results being skewed by patients’ expectation of improvement. The impact of the placebo effect is often estimated to be around 35% but more recent studies have shown that it varies wildly, influenced by a wide variety of factors ranging from which organ or disease is being treated, the cultural or geographical background or setting of the study, down to the colour, shape or size of tablets. Indeed, using an injection or patch instead of a tablet, or even fake surgery can influence the response to the placebo treatment. The response can be so strong that even when volunteers are openly told that they are receiving a placebo treatment they still derive a benefit from it, with some even opting to continue taking their ‘blank’ placebo pills! 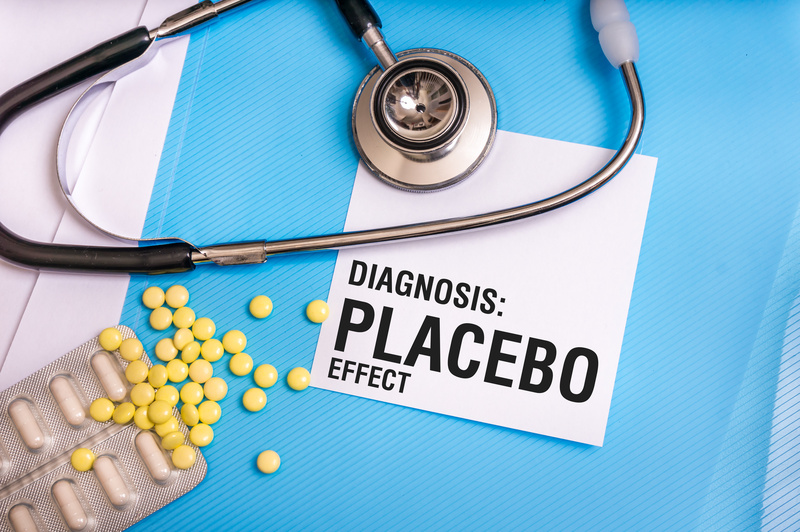 The effect of a placebo can be more marked in treating certain disorders, particularly pain, swelling, stomach ulcers, depression, and anxiety, but also with drugs that act on the cardiovascular system. Back to Dr. David. He gave us examples, with facts and figures to back it up, of how, time and again the placebo treatment performed beyond expectation in trials, in some cases almost as well as the new drug. This caused him to question the role of the placebo, and its opposite number the ‘nocebo’ (where patients get side effects from an inert treatment) in modern medicine. The effects of the placebo have been known about and discussed in medical circles since the 18th century, but it is only more recently that it has gone from being viewed as a dirty secret, a way of giving nuisance patients ‘something’, or an annoyance in research trials to being seen as a powerful effect to be harnessed and investigated using the most cutting edge technology available to us. To many medical practitioners, the success of ‘alternative medicine’ is often put down somewhat derisively, to the placebo effect. Even assuming that’s true, how? How exactly does expecting something to work, believing it will make a difference, actually bring about a measurable effect in the body? This is still under investigation and it will probably be some time before we have all the answers. But for now, what we do know is fascinating. Studies as far back as the late 1970’s showed that people given placebo painkillers released chemicals – endorphins, similar to morphine – in their brains that acted as natural painkillers. But to complicate this further, even patients who were given actual painkillers responded differently when they were given to them covertly – those in studies who were told they were being given a painkiller within their intravenous drip reported better pain relief than those given the same amount but without their knowledge. More recent studies show that different areas of the brain are activated when we are given a placebo vs. a genuine painkiller, with areas of the frontal lobes ‘lighting up’ in response to the placebo. This part of the brain isn’t activated when given real painkillers, but it is involved in anticipating events, in predicting what will happen and in decision making, suggesting that at some level, our brains are deliberately making something happen! Dr. David went on to discuss how other studies have shown that deliberately harnessing this ‘power of imagination’ can have profound effects elsewhere in the brain, too. Various trials have repeatedly shown that the act of imagining, or visualising a movement can cause the same changes within the brain as actually performing that movement, with connections between brain cells growing and strengthening in an identical way. Incredibly, this happened even in brains that have been damaged through injury or stroke, raising the possibility of really improving how such patients are treated, as well as the obvious implications for training athletes and sports people. On a much smaller scale, Dr. David’s work with people has shown that such repeated visualising can affect organs other than the brain, with his patients showing improvements in kidney function, asthma and Parkinson’s Disease among others. There have been fewer research projects that explain how these kind of improvements might come about, but many studies demonstrate that levels of inflammatory molecules such as cortisol and various cytokines (substances secreted by the immune system cells) in the brain become much lower with the reduced stress associated with repeated visualisations, with blood pressure, heart rate and levels of anxiety all also markedly reduced. As an additional note, a theme taken from another of his books, Dr. David also talked about how having a positive mindset and being ‘kind to others’ could have a profound effect on our bodies’ ability to cope with stress. Although this sounds rather more alternative, and less scientific, he soon explained that the chemicals released in our brains when we behave in such a way are able to better manage our cardiovascular system and reduce blood pressure, improve mood, boost our immune system and even help us to age better. Amazing! Sitting in the audience, Ali, Richard and I felt quietly smug. None of this astounding cutting edge science was new to us. As solution focused hypnotherapists, the techniques we studied and use with our clients are rooted in this same science of brain chemistry! We already knew that our clients have reduced stress after working with us, and that focusing on positive events and their positive interactions with other people has a deeply beneficial effect on their mood. Both these interventions have a measurable effect on their brain chemistry, enhancing the levels of mood boosting substances and lowering the levels of inflammatory cytokines so that their physical health is more likely to reflect their improved mental health. Chatting to Dr. David afterwards about all the ongoing studies, it was great to hear that much of the evidence that underpinned his work, his book, and his talks came from research carried out by hypnotherapists – we are, after all, the masters (& mistresses!) of ‘visualisations’! Hypnosis is not, as is commonly assumed, “sleeping”, but a very relaxed state of awareness – trance – which we guide our clients into using visualisation, asking them to imagine a series of colourful, peaceful scenes. Using this technique to lead them into the trance state, we can then get them to practice how they deal with situations, perform on stage, or compete in sports, and even deal with their fears and phobias, as well as use suggestions and metaphors that strengthen their ability to deal with situations. We ask our clients to listen to an audio recording each night, practising this visualisation again and again, which replicates the stress reduction and reduced cortisol and cytokine levels that Dr. David explained lead to the improvements his patients experienced. Our clients might not come to us asking for help with their immune systems, or cardiovascular systems, or to live longer; but it’s a testament to the power of the mind that all these improvements are possible simply by using visualisation techniques to manipulate the body’s systems for a healthier you. Get in touch to book your FREE initial consultation with your local Inspired to Change hypnotherapist. Inspired to Change Hypnotherapists are based across the UK in Peterborough, Northamptonshire, Cambridgeshire, Leicestershire, Devon and Kent.